Solar eclispes happen more frequently than you might imagine – there’s usually one per year. However, they tend to only be visible in often very inaccessible places, such as the middle of the Pacific ocean, or over the polar ice-caps. In 1999 I travelled to France, and managed to get into the zone of totality just south of Paris. We met up with my cousin and his family, who are also dedicated space and astronomy nuts. Sadly, we were clouded out right at totality, though I can still remember my amazement at this great dark shadow rushing towards me at over 1,000 miles an hour. In 2003, I took my gang to Iceland, where the promise of an annular eclipse, a ring of fire rising over a glacier at sunrise was too tempting to refuse. Well, I say “promise”: the good weather prospects were less than 30%, and indeed I ended up seeing only murky grey cloud becoming slightly paler. But still we had a fabulous week in Rejkjavik. In 2009 my husband and I went to China, and joy of joys were in the right place at the right time to experience 6 magical minutes of totality. And of course had an unforgettable trip seeing other fabulous sights such as the Great Wall, the terracotta warriors, and the brash skyscrapers of Shanghai. a period of approximately 223 synodic months (approximately 6585.3211 days, or 18 years, 11 days, 8 hours), that can be used to predict eclipses of the Sun and Moon. One saros period after an eclipse, the Sun, Earth, and Moon return to approximately the same relative geometry, a near straight line, and a nearly identical eclipse will occur, in what is referred to as an eclipse cycle. A sar is one half of a saros. When my cousin and I were researching the France ’99 event, we discovered that the next one in that saros would occur on the day of their 25th wedding anniversary, and it would be in the USA. So I’m currently well into my planning and anticipating this year’s holiday. We will fly from Dublin to Chicago, spend a few days there, before catching the California Zephyr train, which crosses the States terminating in San Francisco. Along the way we will stop off in Lincoln, Nebraska, and drive to the little town of Beatrice which is in the centre of the zone of totality. Beatrice is one of my online usernames, so it seems fitting to go to a town with my name on it. So what should I pack? Chicago is the windy city, even in August, there might be rain, there will be fog in San Fran, and of course we have planes, trains and automobiles to catch. One of the most valuable pieces that a traveller can carry is a versatile wrap, pashmina, shawl. It serves as a blanket when trying to get some sleep, is a stylish cover up for evening strolls, and can be folded into a cushion. 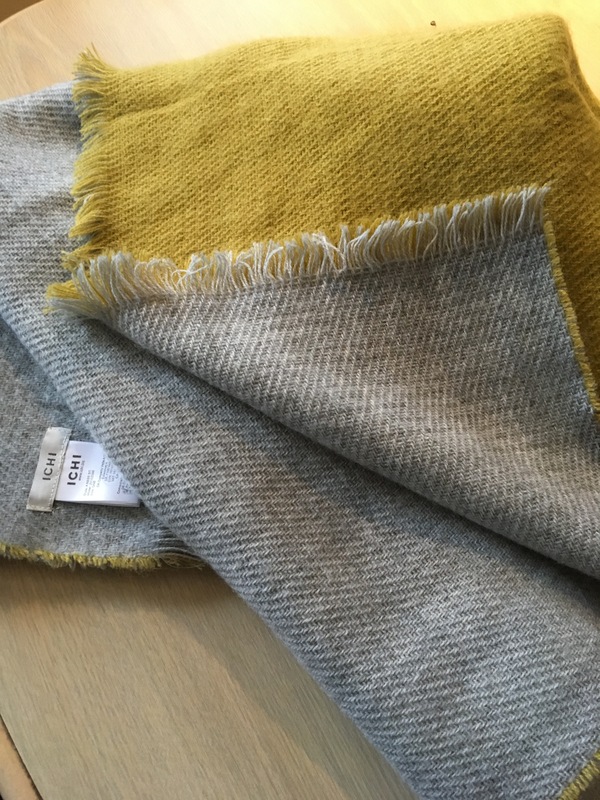 I love this Ichi reversible wrap in dove grey and mustard, which I found on sale for £10 in a little boutique in Carrickfergus called Lisa’s Attic. It looks good, though the mustard side is a bit fluffy and sheds hairs over the clothes beneath. Some companies specialise in being comfortable and stylish. I swear by my Craghoppers trousers and tops, which have features like security pockets, quick dry, and mosquito repellent. And I’ve just discovered Like Mary, an online company which makes gorgeous wraps and shawls, as well as other travel friendly clothing. I treated myself to some cropped harem pants. I’d bought a pair of cheapie harems in Majorca and I love them for relaxing and travelling, as they take up very little room and are easy to dress up or down. I alao bought some wrap dresses and tunics. I was very pleased at the quick delivery service. And when I had to return the wrap dress as it just didn’t suit me, the refund was also very prompt. 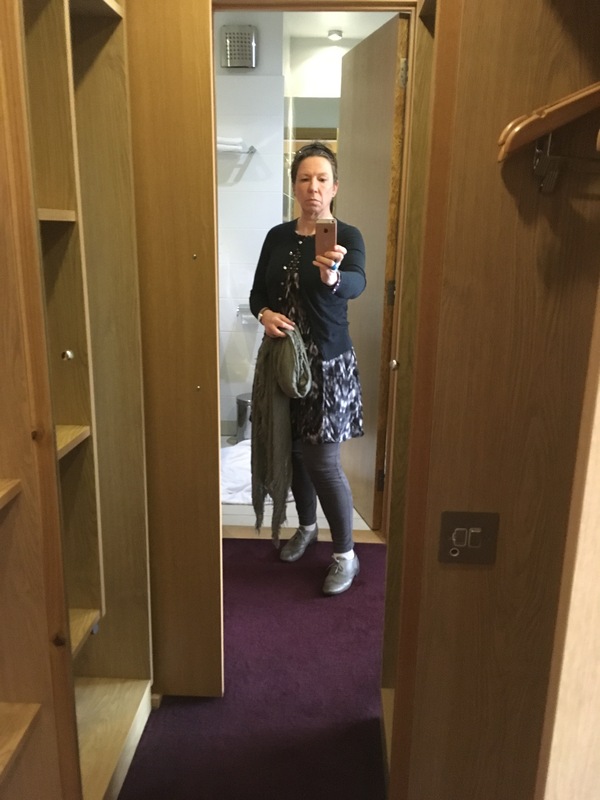 I packed the grey patterned tunic on a recent day trip to Dublin. 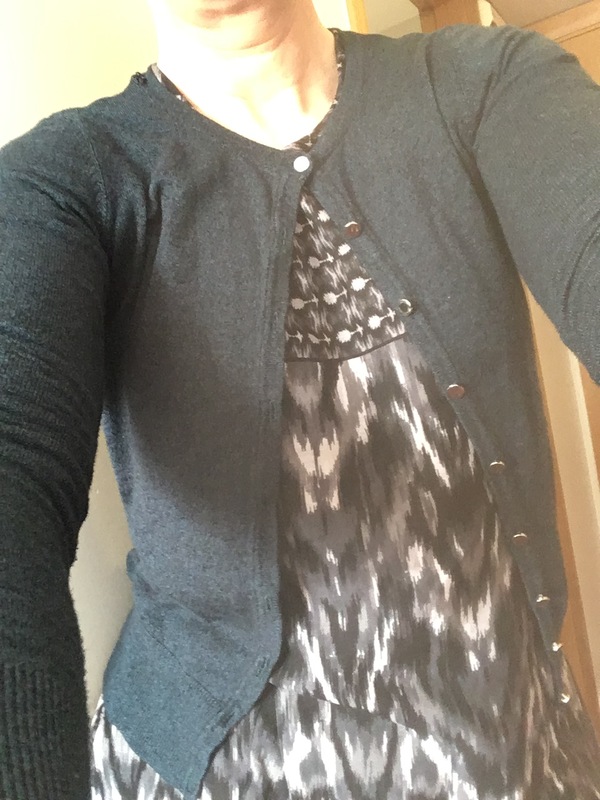 The sun was shining and I teamed it with leggings and a cardi for a stylish and practical outfit. The tunic is lovely and roomy, with great pockets for thrusting your hands into when the breeze picks up. It takes up little space in my bag, and washes like a ribbon, so it is destined to become a firm travel favourite. My only quibble is with the itchy scratchy label which was annoying my neck, but I was able to remove it without too much trouble. 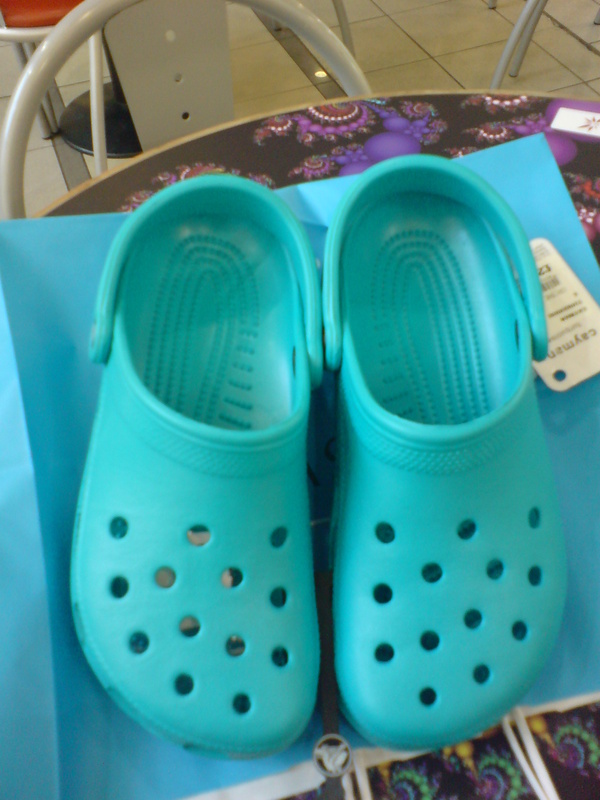 And they are a bit marmite, but I adore my Crocs! They are lightweight and comfortable, especially when doing a lot of walking around a city. And they are waterproof – I even hooked them over my wrists while swimming in Orlando. So I’m not taking them out of my travel staples just yet. Now, I wonder can I find a set of eclipse viewers among my souvenirs……. 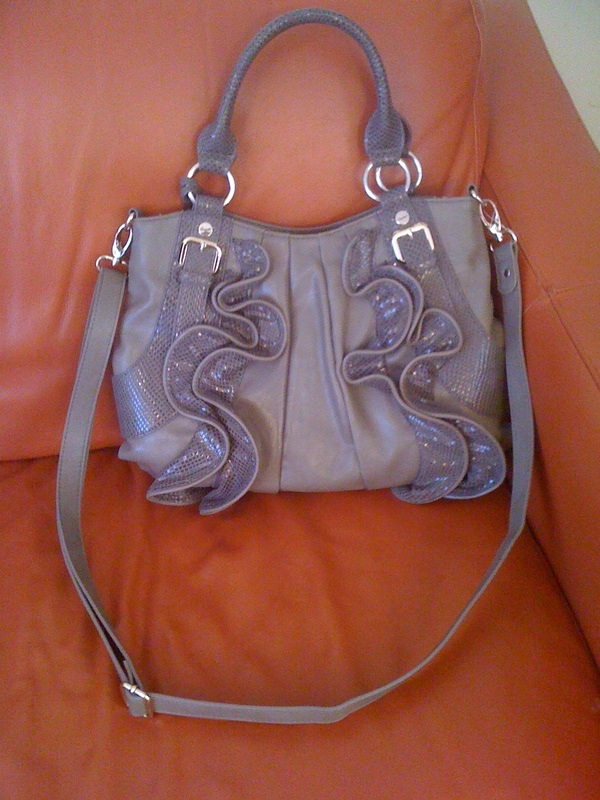 Now it’s not perfect – I love the colour and the fancy material inside, but I could do with a few more pockets for keys, make up etc. Surely there’s a market for this! Started the year with walkies on the beach, and enjoyed Scottish Dancing at Burns Night. Jem auditioned for High School Musical and MT4UTH. In February Max had to go to the vet’s for his shoulder to be X-rayed, and Jem went skiing on a school trip. In March we went to see Flashdance, and Jem sang I’m Still Hurting at her school concert. During April we went on a bike weekend to Kesh, and saw Evita. At Easter Jem went to a course at Bird College, and was awarded the hardest working student cerfickatick. I went to a weekend Scottish dancing course in my alma mater, Coleraine High. In May, my nephew did well with his goats at Balmoral Show, and I received my favourite text of the year from my sister: “Cld u get some cabbages, and if so cld u bring 6?” We went to the North West 200, which was badly disrupted by accidents and weather. We went to see Fame and Cabaret, and I ran a 10k run for action cancer. At the end of the month my son turned 18; we celebrated with a family party in the Hilden brewery, and I made a montage of photos from throughout his life. In June, Jem got to meet the President of Ireland, and appeared as Martha in High School Musical. In July, we went to see Never Forget, and Evelyn Glennie, before heading to China for an amazing trip. The high point for me was seeing that glorious diamond ring of the eclipse, although dancing on the Great Wall was rather fabulous, and the whole trip was truly magnificent. In August, Jem appeared on the stage of the Grand Opera House in Godspell, and my sister described her when she dances as looking as though it’s the most wonderful thing she’s ever been asked to do. She got her photo on the front of the local paper. Mum and Dad celebrated their Golden wedding anniversary, and we had a wonderful party with cake and a song wot I wrote: I’d converted some old camcorder tapes onto DVDs for them, and had fun making covers and and labels. At the end of August I rode my new bike, Zucchero, to Skye, and only dropped it once! And was able to pick it up myself. In Skye we visited Calum’s Road, where R and a group of about a dozen bikers will be setting off next year to ride to The Gambia. In September Harry started university, and Jem auditioned for Guys and Dolls. She also did a photo shoot for the pantomime, and her picture was used many times for publicity. We looked after my sister-in-law’s dog, Mack, when she had to have breast surgery. During October, Jem played the Narrator in her school production of Blood Brothers, and had her Just Dance audition. I visited old friends in Luxembourg and Frankfurt. November brought parents evening, where for the first time I got nothing but glowing reports! She then totally wowed the audiences with her charming portrayal of Miss Adelaide . In December we went to London and saw Legally Blonde, and I decided to do something about the 2 stone I’ve put on since I stopped smoking 2 years ago, and re-joined the gym. I also decided that the deteriorating atmosphere at home, which had included many flouncing outs, 3 day sulks, and a laptop flung across the room, was untenable, and I found a little apartment for Jem and I to move into in the New Year. 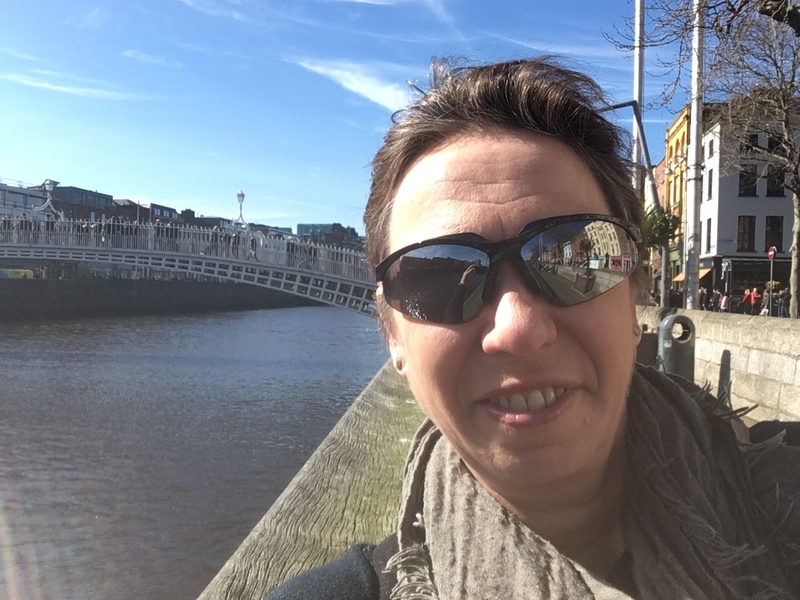 I’m approaching the new decade with a positive attitude – I will lose some weight, I’ll be visiting The Gambia in February, and help Jem get through her GCSEs. Come September who knows where we’ll all be! I’m thrilled to bits with it, and am looking forward to wearing it over Christmas. I tend to buy necklaces and the like when I’m abroad, simply to be able to answer “Oh I got it in Venice/ Luxembourg/ Skye” or something when it gets admired. So I shall look forward to telling people about the jade carving factory just outside Beijing, and the freshwater oyster place in Huangzhou where I picked up these little gems, and of course they are a beautiful reminder for me of a beautiful country. 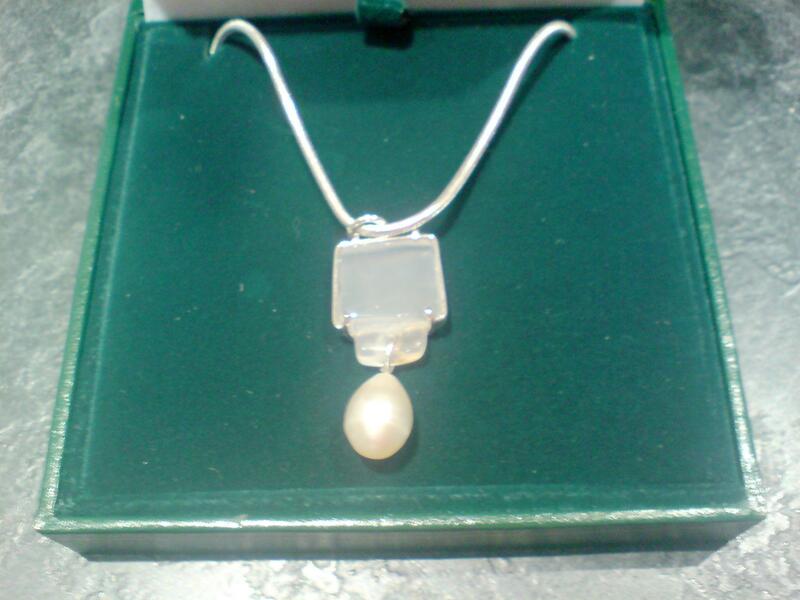 And a big thank you to Margaret Forbes the jeweler for creating such a stunning piece. The city which is used as “base camp” for the trip to see the Terracotta Warriors is Xi’an, which means Peace in the West. It was a former Imperial capital, between 1,000 BC and 1,000 AD, including the prolific and culturally rich Tang dynasty. Much of its historical buildings are well preserved, from the impressive 9 mile city walls, to the great goose pagoda and the bell and drum towers. Although it’s now a manufacturing centre, prone to some heavy pollution and with frightening traffic jams, this city of 5 million people is very pleasant. Being in the north means that it is drier and less humid than the Eastern seaboard cities, and there is more of a contrast in temperatures between day and night than in the southern sub-tropical zone. It is too dry to grow rice here, and so wheat based dishes are the local specialty, particularly the Big Noodles. An astonishingly exotic range of foods is on display at the street markets, including roasted goats feet. I wasn’t tempted. It was so good in China to be able to see the very very old as well as the brand spanking new. I’m a huge fan of modern architecture, and one of the highlights of last year’s Olympics had been marveling at the structures that had been erected for the event. So I was thrilled to be seeing the Birds Nest Stadium and the bubble swimming pool building up close and personal. The village is a huge draw for lots of school parties, and Roger and I were charmed when a group of young schoolgirls, aged about 8 or 9, chorused “Hello!” in unison to us, and then giggled behind their hands when we replied. The usual touts and vendors were there, and though a glass model of the birds nest was tempting, we resisted. This beautiful collection of buildings set around a large lake was the peaceful summer retreat of the Emperor and his family. It was a favourite haunt of Dowager Cixi, who reputedly built the folly of the marble boat with money that had been intended for the Chinese navy. The 900m Long Gallery is decorated with colourful paintings, and noisy sweet corn vendors yell their sales pitch. The lake is peppered with a variety of boating activities.